Removing a traditional C++ control from your project can give you a pain, but not in RadVC. See how easy it is to remove all the files associated with a RAD C++ control from a project. 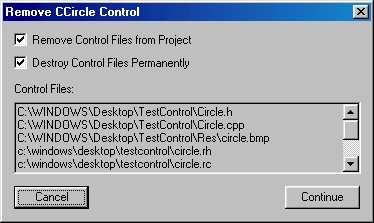 This will display "Remove CCircle Control" dialog box, as shown below. Check "Remove Control Files from Project" checkbox, if you want to remove the control from the currently active project. Also check "Destroy Control Files Permanently" checkbox, if you want to delete the files from your system. Click on the "Continue" button if you want to proceed with the remove operation. 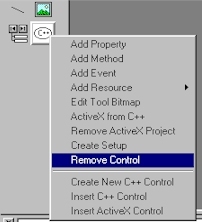 To remove the standard controls implemented by RFC library, click your right-click on any of the standard tool buttons (a command button for example) and then select "Remove Control" context menu item. This will display the following warning dialog (figure below). Click on the "Yes" button on the dialog, if you want to remove all standard buttons from RadVC toolbox.